Knowing the population that this educational app was designed for, developers have certainly created a very kid friendly navigation menu, intuitive tasks and buttons as directions are very short and sweet. In addition, we immediately noticed how both verbal and visual representations were incorporated on the main menu as a way to support all learning styles. Whether your child is a toddler, preschooler or grade level, they want to hear or see words of encouragement. Throughout each game, reinforcements are presented as auditory sounds such as: a bounce, pop or magical stars. As they game for a reason, users will certainly not be surprised or confused when they play the pre-installed games – Letters, Coloring, Scratch & Fill or Matching. Letters – Upon entering the first academic game, users are presented with a 6 page catalogue of animals to choose from. Whether the animal is known as a creature to fear or “ooh and ahh” over, illustrators have done a nice job at designing colorful and eye pleasing graphics with their wonderful expressions and unusual accessories. It is up to the user where they would like to begin. As an animal is chosen, game play within Letters continues in order from that particular animal. Immediately, users will notice that the screen is divided into three parts: draggable Scrabble pieces on the left, animal graphic on the right and its corresponding word at the bottom, grayed out. It is up to the user to match those grayed out letters at the bottom with those Scrabble like pieces by simply dragging and dropping them into their correct places. If a Scrabble like piece is tapped, the narrator will announce that letters name. As users begin to recognize and match letters, it is also important to note that they do not have to be dropped in any particular order. If letters are dropped incorrectly, they will bounce back. Once the animal’s name is spelled, both letters and animal will animate across the screen. Game play continues as the train drops off and introduces the next animal friend. The next gaming option is Coloring which allows users to be creative as they learn various art skills. As they color with Kandoobi: Animal Edition, children will build their vocabulary of color names while manipulating three writing utensils: a pencil, paint brush and an eraser. Coloring exploration can occur in two ways, with those animals previously seen in the “animal catalogue” or as free choice. Regardless of which is chosen, users are given a paint palette of both primary and secondary colors. Depending on a users age and creative need will determine if a thin lined pencil or a thick stroke of a paint brush is required for their coloring page. If mistakes are made, no need to panic, developers have also included an eraser. As coloring pages are complete, share them with others by simply tapping the button in the upper left hand corner, as it is saved to your devices camera roll. Does your child or student have difficulty with their fine motor skills, but love to be creative? Then, the next gaming option of Scratch & Fill is just what you are looking for. Scratch & Fill does not require users to stay within the lines, simply swipe your finger from left to right, up and down and the colors will come alive within the picture. The last gaming feature called Matching is one that has children manipulating with puzzles. At the top of the screen users will see an outline of an animal. While at the bottom of the screen are three choices. The goal is to simply drag, drop and match the correct animal puzzle piece. Kandoobi: Animal Edition is very academically appropriate for this age level. It provides just the right amount of repetition, supports ones creativity, and allows for independence. It is an educational app that disguises learning as fun. To learn more about the Kandoobi development group be sure to visit their website here. If you are looking to stimulate your child’s need for creativity and imagination, then begin downloading Kandoobi: Animal Edition to your iTunes library by simply clicking here. Tonight we continue our series of reviews from developers at AR Entertainment. The next in our line up is part of the “learning is fun” educational puzzle collection called My First Puzzles: The Alphabet. As Applicable2u plays the role of both a parent and an educator, I began introducing my son to what we thought were age appropriate “academic” things (ie. colors, letters, shapes) during his toddler years. Unfortunately the approach that we took wasn’t what our son wanted. When we wanted to practice “academic” things, he wanted nothing to do with learning thus putting frustration on all parties. So the traditional way of teaching was put on hold and we chose to go another route, to make learning fun. When learning is seen as fun, the desire and curiosity builds. If only we had the “learning is fun” educational collection at the palm of our hands several years ago. While playing My First Puzzles: The Alphabet, listen to calming music on your Apple device running iOS 3.0 or later and manipulate small and large puzzle pieces in order to build and match letters. As letters are correctly built, learn how to pronounce all 26 letters of the alphabet. If English is not your native language, not to worry. Developers also offer this educational app in Dutch, French, German, Italian, and Spanish. My First Puzzles: The Alphabet is initially a free download offering four free puzzles as it introduces the first seven letters of the alphabet. While exploring the free version, users will be given a quick glance of the applications potential. For an additional in-app purchase of $1.99, young learners will be able to unlock 12 additional puzzles, thus providing them access and experience with all letters of the alphabet. An added bonus, once your native language is learned, extend the use of this educational app by supporting your child as they learn to say and build letters of the alphabet in another language. My First Puzzles: The Alphabet is a pretty basic, easy to navigate educational app that allows most users to be independent. Playing and learning go hand in hand as your little one drags and drops various puzzles pieces into an empty lettered place holder. Tap one piece and all others will appear transparent. When placed correctly, players will be reinforced with a chime. Once letters are successfully built, each piece manipulated will pop up randomly in a 3D fashion and narrated with its letter name. A note to the developers – once a lettered puzzle is complete, might it be possible that pieces pop up not randomly but rather in a sequential order. By sequential order, we are looking for puzzle pieces to visually represent the formation of each letter of the alphabet. Since the application does focus on school age children, this would be an added bonus and reinforcement. In addition, we wonder if My First Puzzles: The Alphabet will also include the manipulation and building of lower case letters as well in a future update. Using your mobile device has so much potential and with My First Puzzles: The Alphabet learning happens as your child drags, drops and listens for some form of positive reinforcement, a chime. It’s time to steer away from the traditional workbook and hop on board with those 21st century skills as it integrates with your Apple devices. For children who struggle with holding a pencil, that need learning activities like letter recognition as a way to build their fine motor skills then you will want to try My First Puzzles: The Alphabet. Make learning fun by getting to know AR Entertainment and the applications that they have to offer your child(ren) or students, be sure to visit their website here. Children need to know all the letters of the alphabet, so why not download the full version of My First Puzzles: The Alphabet to your device by clicking here. Over the next few days, you will notice that our reviews will be zooming in on one particular development group, AR Entertainment as they have created an educational game collection where “learning is fun” while building academic skills and puzzles. At a very early age, children are manipulating with various types of puzzles, card board and wooden versions. As an educator or parent, I am sure many of you are aware of the collection of puzzles that Melissa & Doug have developed. As toys are evolving with the excitement of mobile devices, now while on the go, in a restaurant, sitting at home or on vacation, game pieces no longer have to get lost. AR Entertainment has designed for your Apple devices running iOS 3.0 or later a wonderful collection of games for children ranging in ages from 2 to 6 years old. This collection is very user friendly, offered in multiple languages, and provides users the feeling of manipulating real wooden pieces while reinforcing academic skills and/or building ones fine motor and problem solving skills. Do you have a young archeologist in your family? Then you will want to download My First Wood Puzzles: Dinosaurs to encourage this love as they build their recognition of both upper and lower case letters and the alphabet. My First Wood Puzzles: Dinosaurs is initially a free download as it provides all parties, parents and children, a quick glance at what the app has to offer. The free version gives users access to all levels of difficulty and experiences with upper and lower case letters, however, only a certain number of puzzles are unlocked. Your young archeologist will be asking for more once they are unable to ‘dig’ any further. With an in-app purchase of $1.99, dinosaur and building lovers alike will have access to all packages, 75 puzzles in total. Once the full version is downloaded, there are no limits to building and what can be learned. Regardless of which level is chosen, gaming happens sequentially. Users may not jump puzzles unless it has been manipulated once. Repetition at this young age is so critical and also rewarding for those building. Upon entering each level, users will see a dinosaur button chart. This chart visually explains to children what has been successfully completed, as dinosaur heads are colored in by its level: blue – level 1, yellow – level 2, and pink – level 3. It also indicates where to go next with a dinosaur head colored in and stars twinkling around it. Those dinosaur heads hollowed out indicate what puzzles still need to be put together. As mentioned early this educational app encompasses several skills: letter recognition (upper and lower case), its placement in the alphabet and the use of ones fine motor skills to build. The concept of building is supported in different ways within each level. Level 1 – focuses primarily on manipulating individual pieces. As you progress through this level, users will see the number and sizes of pieces changing. To support all learners, developers have included a nice feature, when players touch a piece all other pieces become transparent, making it easier to focus on one thing at a time. Puzzle pieces will be scattered around the wooden backdrop and the dinosaur shape with the puzzle piece outline will be in the middle. The objective is to drag and drop pieces to match the outline of that puzzle shape. Pieces do not need to be dropped in any particular order. As your child drags pieces hover over an outline to see if it will line up. If correct, it will drop into place on its own. Once the entire puzzle has been built, pieces will 3 dimensionally pop up. A note to the developers – might it be possible after the 3 dimensional effect to have pieces merge together as one, showing users how they fit together to make an actual dinosaur. Level 2 – encompasses building and letter and order recognition of both upper and lower case letters. Puzzle pieces will now have the chosen type of letter, upper or lower case, on the pieces themselves. Level 2 still provides the outlined pieces within the dinosaur shape to guide children. Unlike level 1, level 2 puzzle pieces must be dragged and dropped in a certain order. This order is indicated by an ABC box in the lower left hand corner of your building screen. As you tap pieces, letters will be announced as it reinforces both the visual and verbal naming of that letter. If unsure of what letter or piece comes next, be sure to review this box as the necessary pieces are highlighted in white. As you progress through level 2, users will notice that the alphabetical order will change, helping children to recall the correct order of the alphabet. Level 3 – is very similar to level 2 in that it provides users an added skill of learning both upper and lower case letters as they build 15 puzzles in each. Since level 3 is considered the most difficult, some of the support systems that were in place in level 1 and 2 are no longer visible here. For example, the hollowed out dinosaur no longer has the outline of the necessary pieces. The ABC box is still present if children are unsure how to build. A note to the developers – as we progressed through level 3 we noticed that the ABC box never went away. Might it be possible as children come towards the end of building in either upper or lower case letters, that this indication box disappears. It would a good indication to see if a child truly grasped those concepts being taught through this application. This would tell a parent or educator that no matter where someone starts chanting off their ABC’s that their child can pick up the song at any point. Overall, Applicable2U liked what My First Wood Puzzles: Dinosaur had to offer. The free version allowed us to get our feet wet, however, to truly build on two very appropriate skills for children ages 2-6, the full version was the way to go! Be sure to continue following the AR Entertainment reviews this weekend as we talk more about letters, animals and spelling. If you would like to learn more about AR Entertainment, please visit their website here. Try out My First Wood Puzzles: Dinosaurs for free today by clicking here to access it from your iTunes library. Are you a Montessori educator or parent? If so, then you are probably familiar with a letter/sound recognition technique called the sandpaper phonics activity. If unfamiliar with this activity, it builds a visual and muscular perception of the alphabet. As children become proficient with letters and sounds, the building blocks to reading and writing will come alive. Whether it’s the Montessori way or the traditional educational setting that you choose to send your child(ren), it is important to build a sound phonics background. Phonics teaches the auditory senses of words. When a child hears the sounds of letters and repeats them while looking at the letters and words in which they appear, he logically connects the written and spoken word together. Developers Arquinauta Consulting from Barcelona, Spain added ABC Kit to the App Store late last year and since then it was 3rd best app for iPad in the Spanish App Store, and also was featured as “App of the Week”. The app can be used either in English, Spanish or Catalan and viewed on any Apple device running iOS 3.2 or later. With an easy to navigate menu, children as young as 2-6 years of age could benefit from this educational app. It provides children just learning their alphabet a very multi-sensory approach. Through exploration, users will be soon KNOW, HEAR and WRITE. Simply select which mode of learning you desire. Upon entering learners will immediately see an ABC strip at the top of the window. With a swipe to the left or right, users will be able to navigate across the entire alphabet. Whatever your learning approach may happen to be, review letters in alphabetical order or randomly. Each mode of exploration will provide you something different. The KNOW mode presents young readers an uppercase letter and a image that starts with that letter. In addition, a narrator verbally shared the sound that the letter makes. If repetition is necessary, users can simply tap the notebook paper. To know additional letters, simply manipulate the ABC strip at the top of the page. A note to the developers – as this age requires a great deal of repetition, might it be possible that as users KNOW the letters of the alphabet letters to have a library of coordinating images. Our thinking is that it could reinforce a larger vocabulary and connection to the known letter and sound. The HEAR mode is very simply the sound that each letter makes, however now it is sharing one added component, both upper and lowercase letters. In our opinion, exposing children to both letter types early on can be very beneficial. As my own son attends a public school educational setting, we began reexamining our own teaching of just uppercase letter. ABCKit can guide him past writing in solely uppercase letters. The last mode of exploration is the WRITE mode. Here users will be able to practice writing both upper and lowercase letters in a tracing like format. To guide users, developers have included an arrow support system. When writing, if users go outside the lines, simply pick up where you left off. If interested, users can click the rewind button in the lower left hand corner and start over if necessary or to try one more time. A note to the developers – when the writer has finished, might it be possible for their drawn letter to be shown without the traced letter in the background. Using the additional space on the notebook, when a user is ready, might they also be able to write the chosen letter on their own. With a very basic output, but highly effective, Applicable2U feels believes that this Montessori methodology can be applicable to you if you have children at home or in school that are just learning their letters/sounds. If you would like to learn more about Arquinauta Consulting, SL please visit their website here. Currently this education app is going for $1.99 in your App Store, you can begin exploring this “kit” today by clicking here to access it in your iTunes Library. Applicable2U would like to introduce TUKU Logics to the educational app world. Recently they developed and launched to iTunes an educational and fun app designed for children ages 2-4. Like most children of this age, they enjoy playing with not a “pretend or play” phone but rather mom and dad’s real phone. So it seems fitting that TUKU Logics chose their first apps name to be Play with the Phone. We have explored this applications capabilities and how it can apply to you. Like most educational apps designed for this age level, the skills reinforced are typically the same. It is all in how the developer decides to present this information. 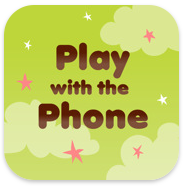 Play with the Phone is divided into five educational fun activities for your little one. Each activity is like a small game board that repeats as you progress. With verbal reinforce and very simple, yet appealing graphics, your child will begin developing academic skills very early on. To navigate from activity to activity, a user can either swipe the iTouch/iPhone devices screen or they can use the arrows in the upper right hand corner. For this age group, I would suggest that they use the swiping option since their fine motor skills are still developing. As children’s interest levels change, it is important to note, that activities can be played in any order. The first activity that the user will experience is Find the Color. Oddly enough, as I look at this game, I immediately think of the balloon carnival game where you have to through darts at a particular color. The objective of this activity is to pop the colored balloon that the voice is calling out. If correct, she will verbally reinforce the user. However, if they have chosen the wrong balloon, nothing will happen, thus allowing them to try again. Unless another activity is chose, Find the Color will repeat and the balloons will be rearranged for continued reinforcement of colors. If numbers are your children’s thing, then they will want to play with Find the Number game. With the appearance of a telephone like screen, children will be reinforcing numbers 0-9. Initially a child could be learning and reinforcing their numbers, but as they progress, they could also be developing another skill. With the support of a parent, a child could be learning their phone number in case of emergency. It might be important to also introduce, the asterisk and number sign symbols for visual recall and word recognition. If your little ones loves anything on the go, then Find the Vehicle will be their new game of choice. With six different vehicles from a car, ambulance or fire truck, your little “go getter” will be in their glory. A user will hear the word, select the vehicle, be reinforced if correct and then hear the sound that the automobile makes. The sounds that the automobiles makes will truly make your child smile. Again, this activity will repeat with different board options to continue to transportation fun. Applicable2u hopes to see additional forms of transportation in future updates. The next activity of choice is the Find the Letters activity. 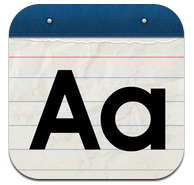 Here the user will be learning and reinforcing capital letters from A-Z. A letter will be announced and the user is expected to locate and tap it, if correct, it will verbally reinforce your child. If they happen to be incorrect in this activity, users will hear a buzzing sound indicating a wrong answer. This is a good introduction to letters of the alphabet. The last activity is a totally different game that Applicable2u thinks will set TUKU Logics apart from all other educational games for children ages 2-4. Their last and final activity is one that is called, Find Someone. Applicable2u thinks it is similar to those baby photo album books that allow you to insert an picture and share with your child those that love them. Before playing this activity, a parent needs to customize the preferences so that the activity will work. Upon entering the application, a parent will see two orange buttons, customize and start. By clicking customize, you will be able to upload 9 images from either your photo gallery or if your Apple device has a camera, an on the spot picture. In addition, you or the family member can record a voice which is then associated with that picture. Once these preferences have been set, your child can know play, Find Someone. By implementing the combination of both audio and visual representations, your little one will truly be surprised. Images and voice recordings can be set back to default to share other loved ones. Play with the Phone offers a number of pre-academic skills that are necessary for our young population. In addition, it provides tons of smiles through repetition, reinforcements and familiarity of those that love them. If you would like to learn more about TUKU Logics, be sure to visit their website by clicking here. Or you can begin downloading this kid friendly app by visiting your iTunes library here.